SANTA ROSA BEACH — Gov. Rick Scott invited supporters to a doughnut shop in the Florida Panhandle Sunday, and was a surprise no-show after about a dozen people showed up to protest his signing of a controversial beach access law. It happened on the first day of a 10-day bus tour across the state that Scott calls his "Make Washington Work Bus Tour." The Republican governor and Sen. Bill Nelson, a three-term Democrat, are in an extremely tight race with each man supported by 49 percent of likely voters, according to the latest Quinnipiac University poll. Scott planned to visit The Donut Hole on U.S. 98 in Santa Rosa Beach. 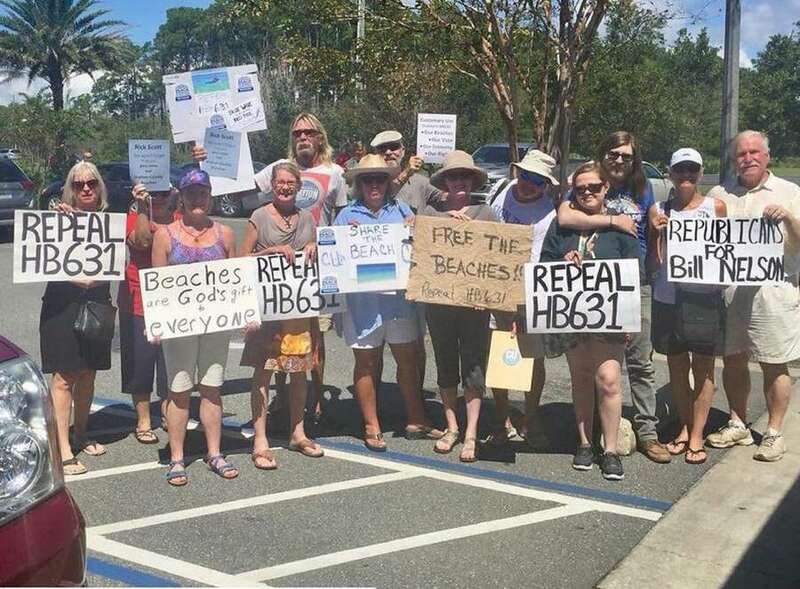 But after the Times/Herald reported on the event, which Scott's campaign confirmed, Democrats cobbled together a small show of opposition against HB 631, a law that requires Walton County to take new steps to safeguard public access to beaches, including suing private landowners. Scott's campaign did not respond to questions about why he suddenly changed his schedule. At a later campaign stop in Panama City Sunday, Scott walked past a reporter and did not respond to a question about the protesters, as a campaign aide interjected: "He's not taking questions." Scott's big blue motor coach was seen on the streets of Santa Rosa Beach Sunday morning. An advance team was at the doughnut shop handing out "Let's Get to Work" campaign signs. A special sound system was installed for the event. Scott is usually very punctual. Customers quickly sensed that something was amiss when he wasn't there soon after 11 a.m., the time his campaign provided. Patti Tate of Sandestin, who wore a red and blue Rick Scott for Senate sticker, said she received an email from the Walton County Republican Party urging that she join other Scott supporters at the doughnut shop. She said she supports the governor's Senate bid, and that "I really don't blame him" for avoiding the protesters. Jim Anders, a long-time local Republican activist, waited in vain for Scott to arrive. So did Bill Hackmeyer, a local condo association leader who strongly supports Scott. "I think he's the best governor we've ever had," Hackmeyer said. Margie Jordan, chairman of the local Democratic Party, handed out flyers that said: "Rick Scott, we won't forget that you gave away our Walton County beaches." "I can't believe Rick Scott is scared of a bunch of little old ladies in tennis shoes," said Lynn Nesmith, a local architecture writer who held a hand-lettered "Repeal HB 631" placard. "We're here because we love our beaches." Others took to social media to express their outrage at Scott's evasive maneuver. Local Republicans waited for at least 90 minutes before concluding that the governor wouldn't show. Scott tweeted his visit to another Donut Hole, in nearby Inlet Beach. Scott's big bus later arrived at Captain Anderson's, a seafood restaurant in Panama City owned by the family of Jimmy Patronis, the state chief financial officer who was appointed by Scott to fill a vacancy. "I was raised around here. I worked on these fishing boats," said Gainer, a successful Panama City car dealer. "I believe everybody should have the privilege of bringing their family down to the beach." Asked if Scott made a mistake by signing the bill, Gainer said: "He thought he was doing what the people over there wanted him to do and I was doing what my heart told me to do … We don't agree on everything." Referring to his opponent, Nelson, Scott said: "What's he given us? High debt, high taxes, and poor credibility around the world. The government doesn't work." Left unsaid by Scott was the fact that it's his party, the Republicans, who control the White House and Congress and sets taxing and spending and foreign policy. "We're going to get the vote out," Scott said. "We're going to have a big win on November 6th."